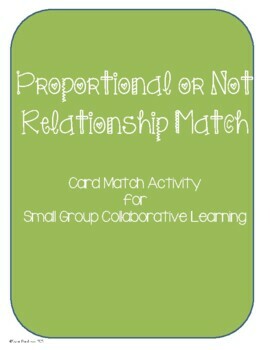 This activity is for students to practice matching 4 representations of relationships and then determining/providing evidence for whether the relationship is proportional or not. 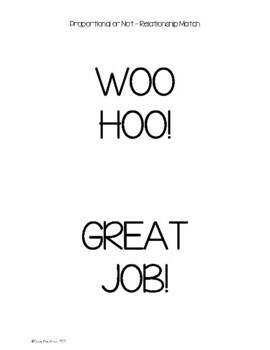 The activity can be done with students working independently or in small groups. 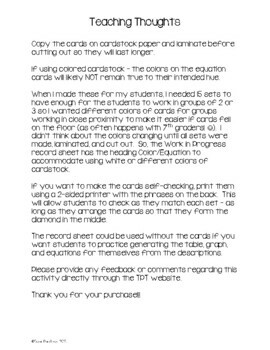 The record sheet could also be used without the cards. If the record sheet is used on its own, students would create the table, graph, and equation from a description and then state whether the relationship is proportional or not. This could also be used as a math station or center when differentiating by providing choices for students in practicing these concepts.